George, could you tell The Big Smoke’s audience a bit about your career thus far, and how you came to launch Harrington Lawyers? My story starts at home. My family is in construction and any free time I had I was on-site, working. This gave me a better understanding of the behind the scenes aspects of construction, which allowed me to better understand my job today. In my early life, when anyone asked what I wanted to be when I grew up I had only one answer and that was I wanted to be a lawyer. I knew from the start that the law and construction was where I was headed. Having grown up in the construction and property development industry and having managed and worked on many construction sites as tradesman and then a project manager, construction has been a part of life since I was a teenager. Throughout university, I became interested in contracts for the civil infrastructure and construction space. Having completed a commerce degree and then a law degree I looked for any role as a graduate solicitor that would foster my interest and passion for construction. While many graduates were happy to take any law role, I was turning them down because they were not construction related. I recall getting my first solicitor role with a specialist construction law firm in 2007, which practiced nationally in construction law, and I recall that I didn’t find out my salary until a month later when I was actually paid something ridiculous. It is never about the money, I always knew this is what I wanted to do. Eight years later, having managed my own matters and clients, I realised that I wanted to service the construction industry and add my touch to the way it was to be done. I always had the intention of running my own firm and that was a goal from the day I gradated university but at the same time I was not going to be irresponsible about it. If I was to provide my services and people’s livelihood was going to depend on my advice, I was not going to do it until I was confident that I could provide the best possible service for my clients. On 1 December 2015, I opened the doors at Harrington Lawyers and have not looked back. Today I lead a team uniquely experienced and passionate about construction law. My lawyers are not simply lawyers but construction professionals that have been in the clients’ shoes and know the clients’ frustrations and use that to get results. We specialise purely in construction, property development and planning law, and don’t intend to diversify our services outside that realm. We love what we do and enjoy doing it, and as Frank Sinatra once said, I did it my way! What do you think it is about the area of law you practice that is most misunderstood by the general public? The depth of construction, property and planning law are unknown to the common person but plays a big part of everyone’s day to day lives and they don’t even know it. It effects everybody from the sole home owner or apartment tenant to the large players from government to multi-million dollar developers. Most people who aspire to buy or build their homes or invest in property have dealt with their local councils or are affected by some form of construction in their local community. 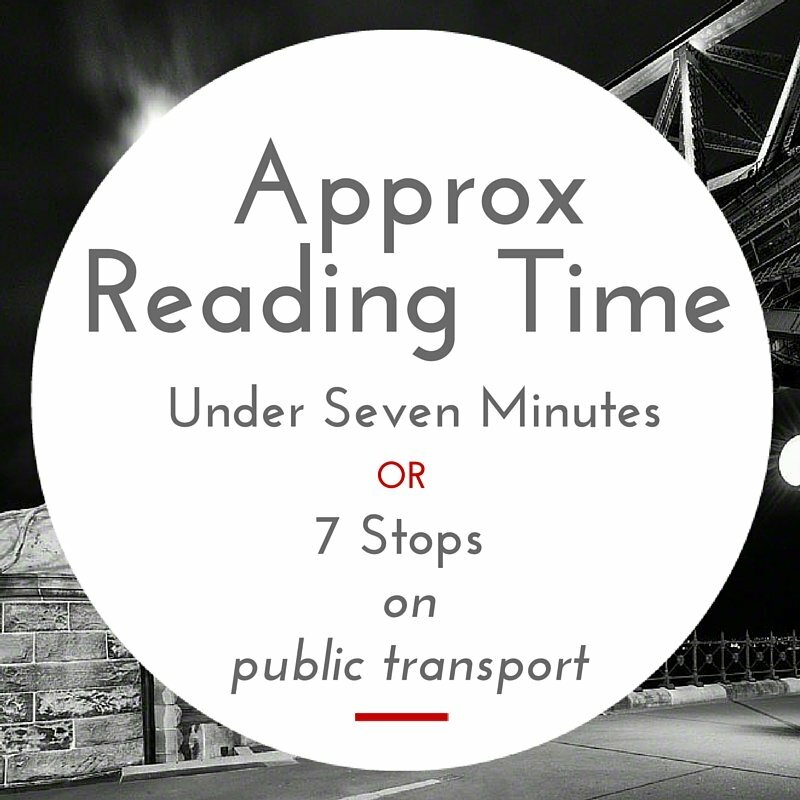 This is particularly the case with Australia’s current infrastructure boom that has reached out and affected everyone’s daily lives. The law in this area is all around us and plays a big role in the way our lives are shaped as projects today are governed by contracts and how they are to be performed, the effects of which ultimately trickle down to how they are delivered to the communities and at what cost to the taxpayer. One of the biggest components of any government budget, whether it be state or federal, is infrastructure spending, which the taxpayer ultimately funds and construction companies deliver. In effect, we are all the consumers and the government is required to deliver. How contracts are drafted, managed and delivered affects the taxpayer’s hip pocket as well as how the results of those taxes are delivered to the greatest benefit to the community. When a client approaches you for the first time, how do they come to realise that Harrington Lawyers can meet their needs better than any other firm? As I discussed earlier, my experience is based on having been in the client’s shoes and I look to hire my team on a similar basis. When a client arrives at my door and requests my assistance I know that I can assist when I realise that I have suffered through the same frustrations that he or she has and I understand not only their problems but the objective that they set out to achieve when they decided to take on a particular project. I like to think that I know the means to the end of the client that asks me for my help. 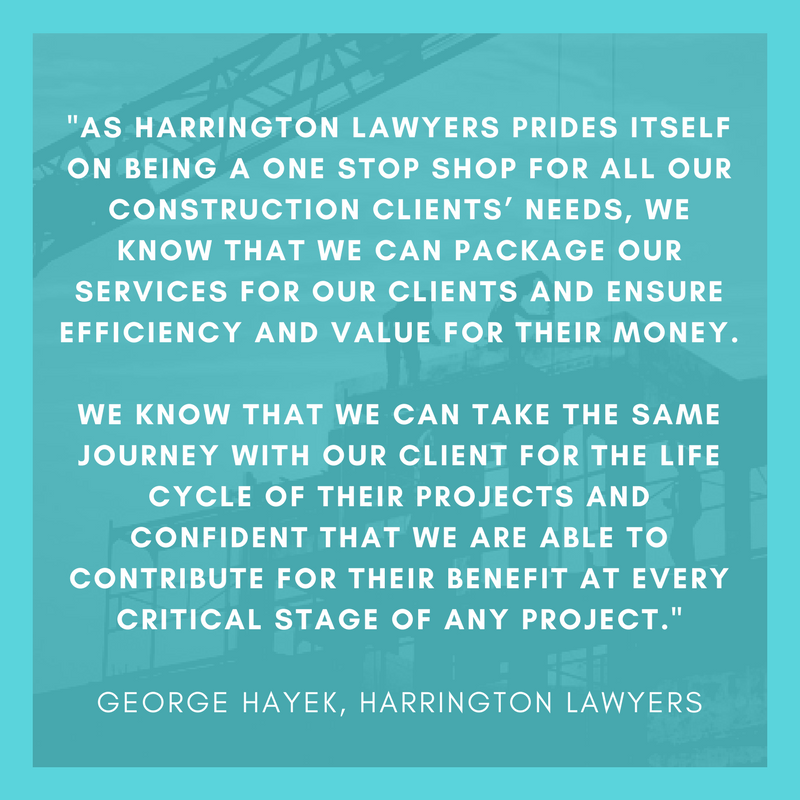 As Harrington lawyers prides itself on being a one stop shop for all our construction clients’ needs, we know that we can package our services for our clients and ensure efficiency and value for their money. We know that we can take the same journey with our client for the life cycle of their projects and are confident that we are able to contribute for their benefit at every critical stage of any project. How does Harrington Lawyers tap into both current technology and legal expertise to deliver the best outcomes for your clients? We rely on technology heavily as both a means to keep up to date with developments in construction law but also to cut down our time spent on files, both of which translate to cost savings for the client. Our legal software keeps us up to date on the latest updates and changes in the legal system and precedents so that we are always ahead of the game. We are also members of various organisations and speak at various functions and seminars that update the industry on new developments. What is the biggest mistake you see contractors make when approaching their contracts? The main one is that it is acceptable to sign a standard contract and take unnecessary risk. You need protection. That is why it’s important to get contracts reviewed and provide measures that will mitigate your risks in the long term. With the amount of competition, the biggest mistake is not factoring enough contingency for unexpected risk. This of course is a double-edged sword, because if they do they may not be the cheapest and may not win the work but if they don’t they will win the work but at the expense of their margins and in the event of unexpected factors, risk a variation or delay not being approved, resulting in a deterioration of their profit margin. I think contracts should be reviewed regularly but the review should be commercially sensible. There is no point in a solicitor seeking to amend every clause when an experienced construction lawyer knows the other side will say “NO!” and move onto the next tender. The experience Harrington Lawyers brings to the table is that we review contracts for risk and ensure the commerciality of any proposed amendments. Due diligence is key; contractors must review everything, make their own informed enquires and not simply rely on the client documents but take that extra step and have it reviewed by their own consultants. The earlier an issue is identified and remedied the less it will cost everyone and the more likely an amicable resolution can be reached. In construction, an issue that is left unresolved and left to fester will result in a domino effect that will lead to a problem so large that its road to resolution will cost more than its final remedy. Too often they are not done or not done properly because of agreements reached on-site which have not been translated to those sitting in the boardroom, sometimes hundreds of kilometres away. Communicate. Send the contract administration staff to the site with the project managers and site supervisors, let them see the fruits of their labour. What do you wish clients understood better about the legal requirements around notices under contracts? For most contractors, I wish that clients would see me earlier in the dispute as the earlier I can get involved the better outcome I am able to achieve. More importantly, I wish contractors were more involved with staff training in relation to contract administration. It is important that the staff dedicated to administering contracts are trained to administer contracts and are in direct communication with the men and women on-site that are experiencing the repercussions of decisions made by those sitting in the boardroom. It is important that staff are trained to understand when and how notices, requests for information, variations and extension of time claims need to be drafted and submitted. Too often they are not done or not done properly because of agreements reached on-site but which have not been translated to those sitting in the boardroom, sometimes hundreds of kilometres away. Contractors must invest in staff training in contract administration as this will reduce risk of disputes, reduce the need for legal costs and ensure that obligations under the contract are met, and that contractors doing genuine work are not shortchanged by some contractual technicality. Communicate. Send the contract administration staff to the site with the project managers and site supervisors, let them see the fruits of their labour. On a personal level, what do you think it is about you as the Founder that has contributed to the success of Harrington Lawyers? I guess my success will be judged by people that have worked with and against me, otherwise I would be bragging, and no-one likes a bragger. However, I do love my job and while I enjoy being a lawyer, I gain far greater enjoyment from the sense of achievement and contribution I make in the construction industry and to the men and women leaving their mark on Australia and its amazing engineering and construction projects. What is your advice to any readers who are thinking about potentially starting their own firm? Have faith in yourself, be in love with what you hope to achieve and never, never, ever give up! I lead a team of specialised and experienced lawyers that focus on ensuring an end-to-end service for civil contractors, builders, property developers, design consultants and subcontractors in the construction, civil, infrastructure and property development industry. My team and I have the expertise and capacity to handle any Australian project in the industry. My clients are involved in the municipal, construction, civil, mining, environment, engineering and property development industries and I have dealt with matters associated with project planning, contract development through to project completion and dispute resolution, acting for both private sector and government departments. 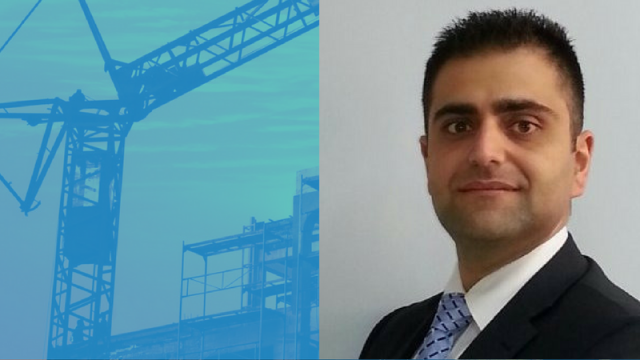 I appreciate the opportunity to be interviewed about my experience and if you have any questions about construction, civil, property development and planning law, please contact me on (02) 9642 7748 or at ghayek@harringtonlawyers.com.au, or you can visit our website at Harrington Lawyers.